In this video we will discuss cross apply and outer apply in sql server with examples. We want to retrieve all the matching rows between Department and Employee tables. This can be very easily achieved using an Inner Join as shown below. This can be very easily achieved using a Left Join as shown below. Now let's assume we do not have access to the Employee table. 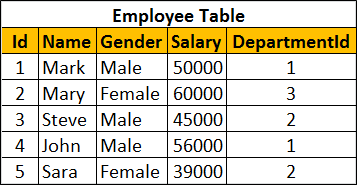 Instead we have access to the following Table Valued function, that returns all employees belonging to a department by Department Id. The following query returns the employees of the department with Id =1. Now if you try to perform an Inner or Left join between Department table and fn_GetEmployeesByDepartmentId() function you will get an error. The multi-part identifier "D.Id" could not be bound. This is where we use Cross Apply and Outer Apply operators. Cross Apply is semantically equivalent to Inner Join and Outer Apply is semantically equivalent to Left Outer Join. 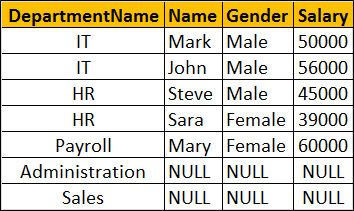 Just like Inner Join, Cross Apply retrieves only the matching rows from the Department table and fn_GetEmployeesByDepartmentId() table valued function. The APPLY operator introduced in SQL Server 2005, is used to join a table to a table-valued function. The Table Valued Function on the right hand side of the APPLY operator gets called for each row from the left (also called outer table) table. Outer Apply returns matching + non-matching rows (semantically equivalent to Left Outer Join). 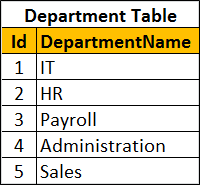 The unmatched columns of the table valued function will be set to NULL. Thank you very much for great video tutorial.This is very helpful to me and others also .My request is also upload the videos of OVER ( ) CLAUSE and Partition also Thank You...!!!! In the above Outer Apply you have mentioned it is same as left outer join. Any specific reason why you have mentioned left "OUTER" join. Left join and left outer join are the same. Please correct me. OUTER JOIN IS 3 THREE TYPES. THERE IS NO DIFFERENCE BETWEEN LEFT JOIN AND LEFT OUTER JOIN. You say outer apply is semantically equivalent to left outer join can you draw the same parallel with right outer join?